1) HOW WILL I FIND THE TIME? I am ALREADY busy! The most fleeting and precious resource for any health professional is TIME. Video and audio lessons – download and listen in your car or at the gym! You will have immediate access to all of the video lectures with slides and references as well as audio files that you can download so that you can listen in your car, while exercising or cooking or after your kids go to bed! You will also receive summary notes of every lecture and every Live Grand Rounds Call to enhance and reinforce your learning and to SAVE YOU TIME! Regardless of what your schedule looks like, you can consume this course in an hour or two each week or spend a long weekend immersed in all the content and resources. Your new skills and knowledge will immediately create tremendous value for your patients and you will soon become their trusted Integrative Cancer Care Expert, grow your practice, serve more patients, and increase your income. 2) WHAT IS THE COST? IS THERE A PAYMENT PLAN? I am not sure about making the investment. 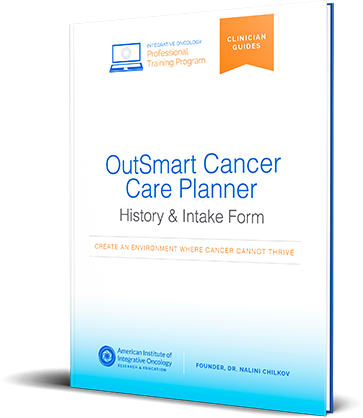 By making the decision to learn the OutSmart Cancer System and joining the Foundations of Integrative Oncology Course you will gift yourself with the opportunity to expand your services, grow your practice and increase your income as you make a difference in the lives of your patients. Are you ready to become the go-to-expert in your community? There is a shortage of integrative cancer care experts. One in two men and one in three women will be diagnosed with an estimated 19 million cancer survivors by 2024….Once the word gets out, patients will be calling! Your investment in this course has the potential pay for itself many times over. As a dedicated and leading edge professional you have already made a significant investment in your professional expertise and development. The cost of this course is only $5,000. With the $5,000 worth of bonuses included with the course, that’s a savings of $5,000! Additionally, I’ve created a simple payment plan if you need to stretch the investment out to fit your budget. You can choose 4 monthly payments of only $1,350 or 6 monthly payments of only $997. This course saves you the cost of years of specialty education, and the cost of travel and being away from your home and your practice. The cost of live case supervision would cost thousands of dollars alone. Instead you can get 6 months of live Grand Rounds Calls with me where you can ask questions and present your cases. This is included in the price of the course. This course is the fruit over 30 years of my own ongoing education and experience caring for thousands of patients and training hundreds of professionals. This course is designed to save you time and money! The information in this course is not being taught anywhere else at this price or with the ease of online learning which ALSO saves you the cost of air travel, hotels, meals and parking expenses…and the cost of being away from your practice and your loved ones. 3) IS THERE MENTORING AND SUPPORT? WHAT IF I HAVE QUESTIONS ABOUT MY PATIENTS? With your course, you will receive 6 months of Live Grand Rounds calls with me as part of your investment. This is where you can submit cases for review and discussion and get individualized answers to your questions.I teach a Clinical Pearl at the beginning of each call so that your learning is ongoing. PLUS, you will have access not only to the recording, but also succinct summary notes with references…available after every call! That is a time saver! Working with cancer patients is complex. The only way to really learn and develop your hands on skills is to be able to get help while you are in the trenches with your real patients. Not only will you learn the same protocols I use in my clinic, but you will also learn how I approach a case and a treatment plan and how I individualize care. The Grand Rounds Calls are essential. When new relevant research is published, I will bring it to your attention. You will gain understanding of drug-herb and drug-nutrient interactions case by case. You will learn how to speak with your patients and with their physicians so that you can develop collaborative relationships and become the go to referral in your community. 4) WHAT IS INCLUDED IN THE COURSE? 5) WHEN DOES THE COURSE START? 6) HOW DO I KNOW IF THIS COURSE IS FOR ME? This course is for dedicated, leading edge frontline health professionals like you who want to grow and expand their practice, feel confident and prepared and are inspired to become a Integrative Cancer Care Expert to better serve their patients.Do you want to feel prepared and competent in supporting the health and well-being of patients whose lives have been touched by cancer? This course is for your if you want to deliver health and change lives as you learn to assess and transform the tumor microenvironment and create a body where cancer cannot thrive! This course is for you if you know that developing expertise requires ongoing mentoring and guidance. This course is for you if you want to become part of a community of like-minded health professionals who will share ideas and information, engage in dialogue and give each other support. I want you to start helping your patients with their cancer prevention, recovery and care with confidence and skill now so that you can have more impact on their healthspan and their lifespan. Seize the moment! Jump in! You will be able to serve more patients AND recoup your investment. Finally, I’ve taken away all the risk of investing your hard earned capital on this program by providing a no-questions-asked 30-day money back guarantee. 7) WHAT IF I CHANGE MY MIND? CAN I RECEIVE A REFUND? If you get into the course content and the library and you do not feel it is for you, if you do not feel energized and inspired, or if you just change your mind, we will make it right.If you aren’t satisfied, just let us know within the first 30 days after your purchase and we will refund 100% of your investment. No questions asked. You have 30 days to inspect and explore the course materials and to decide if this course is right for you. If you still have questions before you’re ready to get started with the course, please get in touch at support @ aiiore.com and let us know how we can assist you. We will respond to every email within one business day, so don’t hold back with anything. Make sure you ask all of your questions and express all of your concerns. I want you to feel completely confident that the Foundations of Integrative Oncology Course is the perfect complement to your current practice. 8) DO I NEED A CERTAIN LICENSE TO BE ABLE TO TAKE THE COURSE OR PRACTICE INTEGRATIVE ONCOLOGY? YOU WILL BE GOVERNED BY THE LAWS OF THE STATE IN WHICH YOU PRACTICE, AND THE PRACTICING BOARD(S) UNDER WHICH YOU ARE ALREADY LICENSED. THE LAWS AND PRACTICING BOARDS OF EVERY STATE ARE DIFFERENT, AND AS SUCH, THE AMERICAN INSTITUTE OF INTEGRATIVE ONCOLOGY MAY NOT ADVISE YOU AS TO YOUR INDIVIDUAL PRACTICE RIGHTS. The Foundations of Integrative Oncology Course has been designed to support successful application for practitioners trained and licensed as medical doctors, osteopaths, chiropractors, nurse practitioners, acupuncturists, naturopaths, and more. While most health practitioners find an acceptable and legal way to apply this training in practice, on their own or by working in conjunction with a Medical Doctor who can assist with labs and supplement prescribing for their patients/clients, we recommend that you carefully review your scope of practice within your jurisdiction. Ultimately, this training is for front line health professionals who are motivated to incorporate integrative oncology knowledge into their practices. As such, we welcome a variety all of professionals into the community. We all learn from each other.